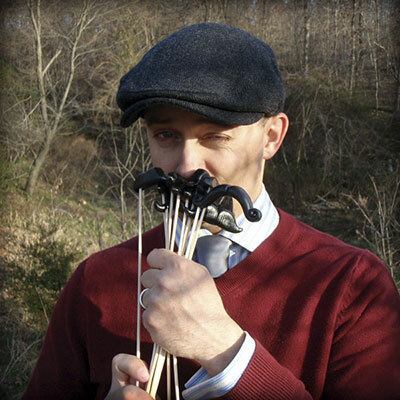 Whisker Works offers crowd-pleasing, high-quality, durable, long-lasting comical mustaches and lips on sticks that are sure to add a hilarious twist to any celebration! Whether used as wedding or party favors, silly photography props, photo booth accessories or for personal entertainment, nothing says fun as uniquely as Whisker Sticks. Thousands of satisfied customers agree. Molded in hard plastic from handmade clay originals, all mustaches and lips are very durable and strong. They’re also easily cleaned with soap and water, which makes them more sanitary than other paper and felt products. All of our props are BPA- and phthalate-free. For added durability and strength, steel rods are available in place of standard wooden dowels. This is ideal for repeated use and events where children or alcohol may be involved. Whisker Works is a husband-and-wife team based in Sanford, Florida, USA. We pride ourselves with being an all-American business, from start to finish. An average day for us starts at dawn, with an hour or two of responding to e-mails and organizing a production list for the day. Then we'll move outside to finish up props – sanding the rough spots and drilling holes for the dowels. The props are then finished up with a washing and hot glue gun. Packing and shipping comes next, a process that consumes a couple hours. From there, we'll spend the rest of the day pouring polymers for new props, photographing and creating new listings, or catching up on more e-mail. It adds up to a lot of hours, but we enjoy the work – because the world could use a few more mustaches. We celebrated our marriage in October, 2009, and at the reception we displayed a dozen handmade mustaches on sticks alongside disposable cameras for guests to have fun with. They were a huge hit and we received countless compliments from friends and family. Better than that, we have photos that show the happiness and hilarity the mustaches brought to our wedding – they're easily some of our favorite photos from that night. 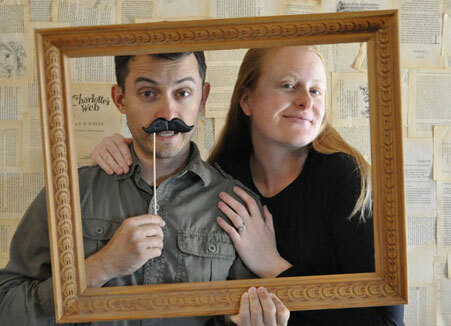 After a couple of months in rural Missouri, where we relocated for Alex's Army career, Amber realized she needed to find a creative outlet – and the wedding mustaches kept getting compliments. She decided to see if anyone out there might want to have some of their own. The day she signed up for a shop on Etsy, she had her first sale! Eventually after a couple hundred sales, and the feeling as though this might be bigger than initially expected, we decided Whisker Works deserved its own place on the Web. And here we are, more than 50,000 props later! Male and female, young and old, these silly mustaches and lips bring friends and family together in a hilarious way. We'd call that a successful ingredient for any celebration.